Did a few household chores and ran errands in between jewelry projects. Cleaned porches and stairs, dishes and floor mopping. Easy stuff that heads off depression due to feeling lazy. 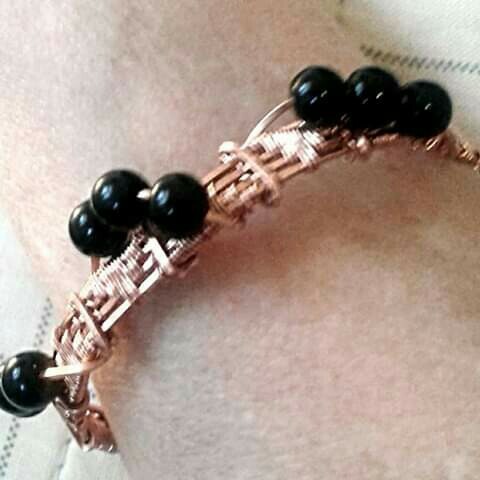 Not happy with The Conductor bracelet: love the weave, hate the ends, which were a result of me futzing around trying to figure out what I wanted, then being too lazy to rip a starter out One. More. Time. and instead trying to cover it up. Learned a lot though, and it will do what it’s meant to do and I sure won’t wear it casually, which is good. Started reworking my moonstone ring yet again- It’s a softer stone and sooo vulnerable to scratches, so that high dome needs a more protective wrap. Not something I could complete in an afternoon though, since the stone needs some time to set on the mount first. With that in mind I started a half moon wrap around a large Merlinite cab. 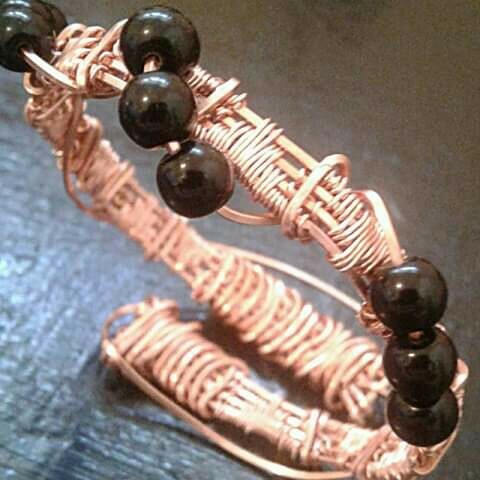 I want to practice a figure 8 weave for the ring, and a large wrap in copper seems a good way to start. I got the base wire wrap started and shaped to the cab, but taped it and set it aside for tomorrow. Been at it since 6:30 this morning and 12 hours of projects seemed like enough. I’ll pick it up tomorrow, hopefully fresh and caffeinated.